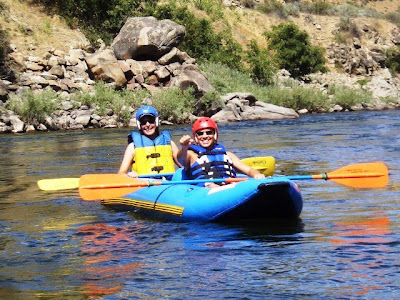 Idaho Chicken Ranch: Rafting the Payette! My husband returned safely from Montana just in time to take advantage of our invitation to raft the Payette River! Whoo-hoo! There were 11 folks and three vessels in our party. Mister N and Captain Ron...er.... Captain Eric... "You can do it, mates. I've never seen such sailors. Not in all my born days, I ain't. Naturals. My God, everyone of you, naturals..."
I don't have a waterproof camera, I just have an old Casio that I put in a sandwich bag and it seems to keep taking whatever I give it. We call it the adventure camera. Anyway, because of this, I could really only shoot on the flat water stretches. But here's a bit of a rapid that we successfully navigated! The "parking lot" for our beach picnic lunch! Because our steadfast captain kept an eye out for sharks and pirates, I was able to lie back for a bit and enjoy the float. Sleepin' on water is the best ever. Success! SUCH a fun trip! !